Thomas wakes up in complete darkness with no memories of where he is or how he got there. He realizes he is in a box moving upwards for what seems like forever when finally the elevator stops and the top door opens. Blinded by the light, Thomas eventually focuses on a group of boys peering down at him. 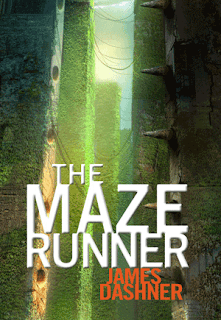 Frightened and confused, Thomas leaves the elevator and enters the Maze. Actually he enters the Glade, the home of this group of lost boys, which opens up to the Maze, an ever-changing towering stone maze that holds the only hope of escape--if the boys can evade the monstrous Grievers and stay alive long enough to find it. Just when Thomas thinks things are strange enough, the box makes an early delivery and this one is a girl who sparks some memories in Thomas. I read this book based on a recommendation from my 11 year old son (and so we could watch the movie together ((book better than movie))). He loved the book. I enjoyed it as well. There are plenty of scary and suspenseful moments and I think this is the strongest of all three. This book leaves you with so many questions but is a good choice for readers who love all things apocalypse.